China is the world’s biggest investor in clean energy. The country is also very proud of their national symbols. The most prominent of these being the Giant Panda, Chinese Dragon, and Red-Crowned Crane. 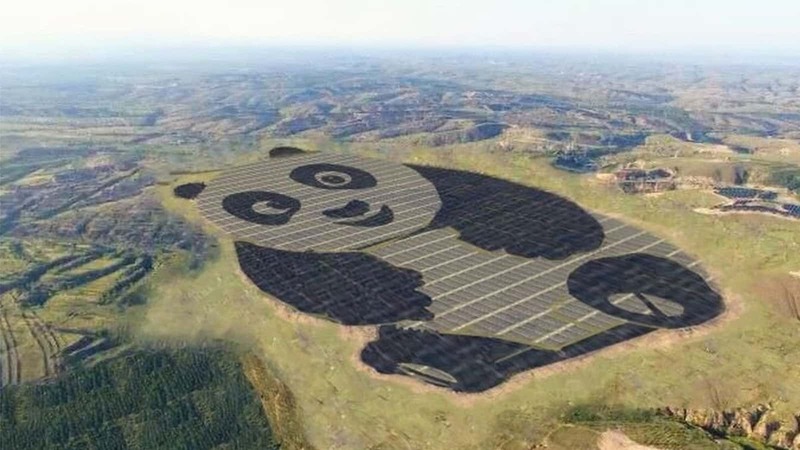 Now the country is taking its love for the black and brown bear to a whole new level with a panda shaped solar farm. In a bid to show the world just how committed the country is to renewable energy, China has just finished a 250-acre solar farm in Datong, in the northern Shanxi province. This is by no means a small feat. What makes it even more amazing, however, is that the entire structure is shaped to look like a panda! The interesting power plan comes by way of Panda Green Energy, and the way the company did it is quite smart too. To create the visual effect of darker and lighter solar panels, Panda Green Energy used both darker monocrystalline silicon and lighter thin-film cells. This way, the company could set the arrays up in such a way so as to allow it to mimic the shape of the country’s national animal. Thus a panda shaped solar farm was born. The panda shaped solar farm houses a power capacity of 100 megawatts and was connected to the Republic of China’s grid in 2016. Within 25 years, this panda shaped solar farm will generate over 3.2 billion kilowatt-hours of clean power. This means that the country will save “1.056 million tons of coal” and reduce carbon emissions by 2.74 million tons in just as many years. Panda Green Energy plans to install more panda plants in the future as part of their Panda 100 Program in Belt and Road areas. Some of the plants could potentially be built outside of China as the program is targeted towards cooperation among different Eurasian countries. China added around 35 gigawatts of solar capacity throughout 2016. This was mostly in the form of large-sized photovoltaic projects. According to Wang Bohua, secretary-general of the China Photovoltaic Industry Association, the country could add 30 gigawatts of new solar capacity by the end of 2017. What if Your Favourite Superhero had a Corporate Sponsorship? Which Path Would You Choose?